A movie still from the new film “2012” depicting the end of the world. The hype isbeginning to invade the cultural landscape like bio-engineered kudzu: the endof the world is a mere three years away. In lateDecember, 2012, thanks to an unusual celestial alignment ? or maybe just theexpiration date of the Mayan calendar ? our planet will be wrackedand ruined.? Look on the bright side: you can blow off your estimated taxpayments for that year. Hollywoodproducers ? never ones to miss a silver lining ? are hoping to make some haywith Earth?s imminent quietus. 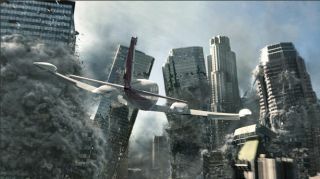 A soon-to-be-releasedfilm, bearing the inventive title ?2012?, will let you see just howvisually stunning doomsday can be. Thebrouhaha has got some people?s knickers in a knot. Scientists have waded intothis sticky chiffon of pseudoscience and hyperbole, and told everyone to coolit. The end is not nigh, guy.? After all, the apocalypse is routinelypredicted, but always fails to appear.? This isn?tjust a reference to the somber forecasts of the Heaven?s Gate crowd, or otherdire warnings at the turn of the millennium ? forecasts that were wildlyinaccurate. No, you have to consider the big picture: There?s been life on thisplanet for nearly four billion years, and nothing ? notasteroids, gamma ray bursts, shifting magnetic poles, or the occasionalsupernova ? nothing has managed to snuff it out. Life?s tougher than aleather sandwich. The ideathat the Mayan calendar could tell you when the world is going to end is straight-outgoofy. Heck, if the Mayans were this good at divining the future, you?d thinktheir empire would still be around. As for cosmic alignments ? well, theyhappen all the time, and no one seems the worse for wear. And indeed, whatdifference could they make? Work it out: even when Jupiter is closest to Earth,the force it exerts on our world is 20 thousand times weaker than that exertedby the Sun every day (and the influence of the other planets is far less thanJupiter?s).? So exceptfor those benighted souls who insist on confounding movies with reality, thewhole thing is a tempest in a teacup, right? Isn?t that what all the sciencetypes will be writing once the film hits the multiplex? Of courseit is. But there?s also this: doomsday for humans really will happen, atleast if a few hundred million extinct species are any precedent. It?s beenestimated that 99.9 percent of all the critters that ever wiggled or waddledacross this planet are past tense. In other words,and despite the fact that we blithely think of ourselves as the crown of creation,we?re no more Nature?s ultimate product than?56 Chevys were the last of thecars. Our species will come to an end, and, presumably, be replaced by a newmodel. But notyet. Not in 2012. And the reason is what I call the ?why now?? factor, which isreally only a temporal version of the Copernican principle. Stated in simpleterms, today?s not likely to be a special time. Here?s anexample. Many people are convinced that aliens have come to Earth toabduct humans. But why now? Why is it that, given 10,000 generations ofhuman history, the aliens are bestowing their unwanted attentions on people today?That?s like winning the lottery, even if the prize is not as savory as a pileof cash. Princetonphysicist J. Richard Gott exploited this idea a decade or so ago to gauge everythingfrom cosmic timescales to the run of Broadway plays. A simplified Gottcalculation of Homo sapiens? tenure would go like this: Adopting the?why now?? philosophy, we can say with 98 percent certainty that humankind isneither in the first 1 percent of its existence, nor in its last 99 percent.Doing the arithmetic, that implies our species has something between twothousand years and twenty million years to go. Thosenumbers don?t include ruin in 2012. But ofcourse you might argue that the ?why now?? principle doesn?t hold because we?remaking today special by wrecking the world. Just about any school kid canrattle off schemes for turning humankind into exhibit fodder for the museums ofthe future: climate change, nuclear war, pandemics, or just depletionof essential resources.? As bad asthese contemporary troubles might be, it?s hard to argue these threats couldwipe biology from the face of the Earth. And in anycase, the type of doomsday scenarios examined in films such as ?2012? aren?tdestruction at our own hand. They are lugubrious calamities caused by externalfactors (e.g., pernicious galactic alignments). For such external phenomena,which take scant notice of humans, the ?why now?? principle applies.? To think otherwiseis merely to assume that the cosmos revolves around us. And that idea was giventhe boot more than 500 years ago. Seth Shostak is the author of Confessions of an Alien Hunter.